Are you looking for a boot dryer which also refreshes your shoes? Then the Shoefresh boot dryer is perfect for you. The Shoefresh dries quickly and efficiently. But the unique thing is that it also refreshes your shoes effectively using Active Oxygen. Within 25 minutes your shoes are cleaned and dried. Perfect for your whole family. The Shoefresh is very easy to use: as soon as you place your shoes on the holders, the program will start. During the first step the shoes are cleaned using Active Oxygen technology. Active Oxygen (ozone) tackles the bacteria and fungi that cause smelly shoes. During the second step the shoes are dried from the inside out. To make sure all the sweat / moisture is completely removed. Your shoes will be fresh and dry again within 25 minutes. The Shoefresh is suitable for all sorts of shoes: sweaty sneakers, sport shoes, ski boots etc. But on top of that you can also use the Shoefresh to refresh and dry your biker helmets, shin pads and gloves. Even orthopedic shoes are safe to use on the Shoefresh. Socks that are not fully disinfected in the washing machine, can be fully cleaned on the Shoefresh. This makes the Shoefresh perfect for every day use! 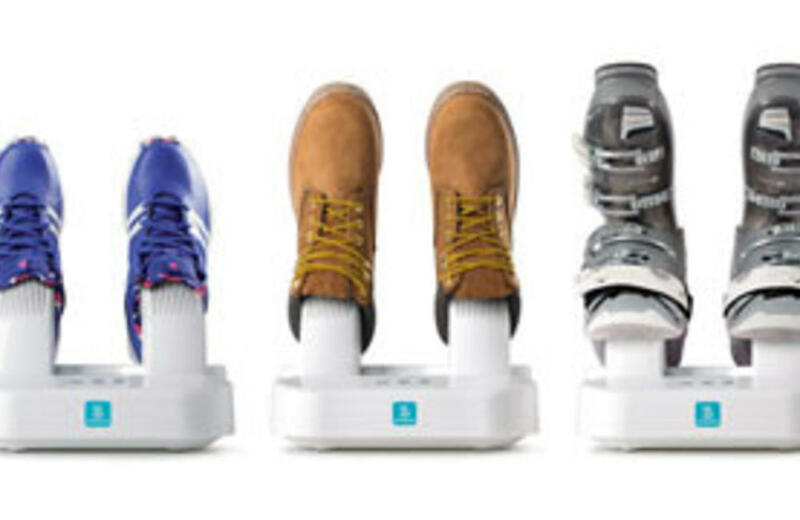 Click here to order the Shoefresh boot dryer. UK delivery within 1-3 working days.